This fall I went home again. 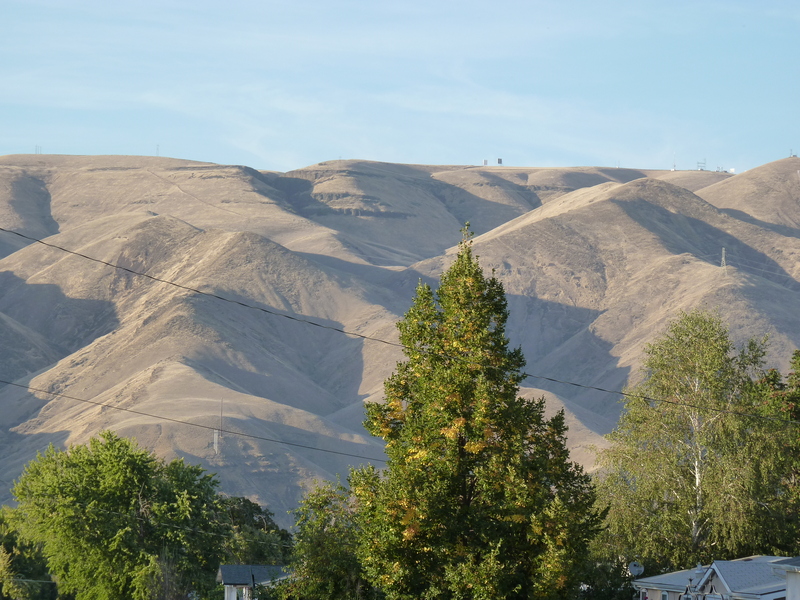 Back to Lewiston, Idaho where I was born and Clarkston, Washington, where my Granny lived. The Snake River separates the two cities. I lived with my Granny during the 2nd and 3rd grade. It was a great time to live in a small town. Kids had free range. All the neighbors knew each other, and if you misbehaved, they didn’t mind calling Granny and telling her. Like the time I discovered how delicious fresh peas were right from the pod in the neighbor’s yard. I should have thought to pick up the pods. They were evidence. The neighbor got me back, though. She locked herself out of her house, and I was pushed through a small bathroom window, which was scary as it was high. I was promised an all-day sucker, but that never happened. Adults shouldn’t break promises to kids. But the hills above are my touchstone. Their strength, their bigness, dominates the landscape. Just looking at them makes me homesick. They have a new highway that goes up them, but back in the day, it was a narrow road, with a lot of switchbacks. Halfway up was a short cross that was stuck in the ground, with tattered fabric fluttering in the wind. The song, “Old Rugged Cross” always came to mind and reminds me of home. I don’t know who owns this house, but it is picture worthy. 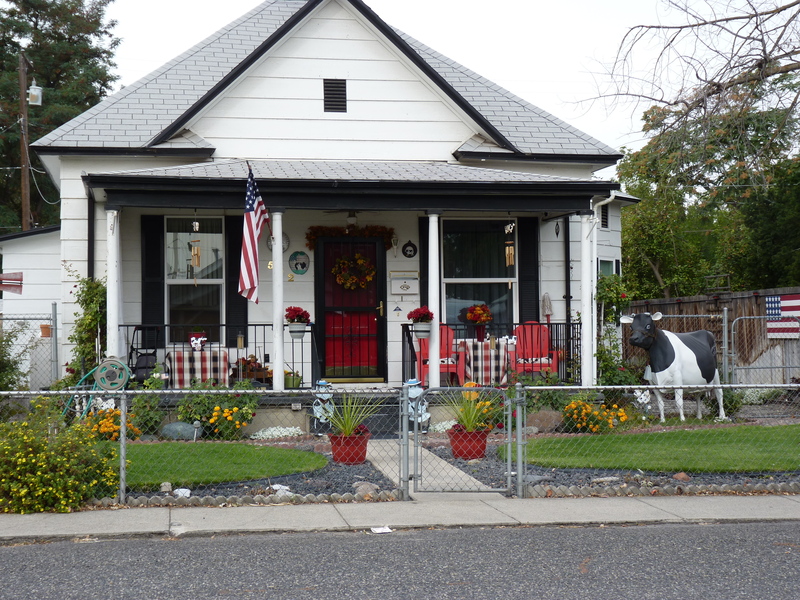 I especially like the whimsical cow in the front yard. How many people have that? It makes the owner happy and that’s all that counts. I might need to use it in a book sometime. Then there is this lovely old lady. Her bones are there, even if they are leaning to the side. I drove down to Long Creek, Oregon with my aunt and sister. My aunt is seven years older than I am, and one summer we spent a week or two there. I always wanted to go back. 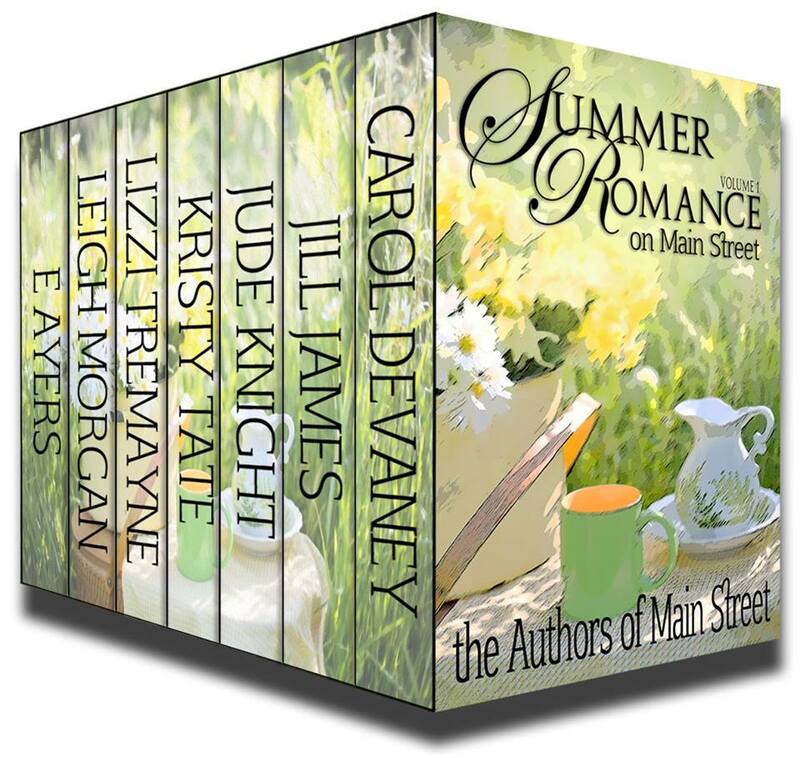 A small town with only a few hundred souls…I am related to some of them. Now I don’t know if this is the same house, but I remembered the side of the street (mind you I was seven) and that there were two stories, as we slept upstairs and the front porch had a railing, which I fell off onto some rose bushes. Yes, they had thorns and I was warned to be careful. This house might be hers…I would have to do some serious research. But it must have been beautiful in it’s day. Back in the day, we went to the General Store and the storekeeper asked me who I belonged to. That question stumped me. Then I blurted out, I’m with my granny visiting with Aunt Dot and pointed in the direction of the house. He asked my granny’s name, and once I told him, he nodded. Aunt Dot had a brother named Walter. Now that was a character. He lived in a small house, but he had a burro or donkey which he used to go into the hills. He had a ‘hidden’ gold mine and when he would run low on funds, he’d take his sack of dirt from the mine and throw a couple of handfuls into his gold pan until he found what he needed. From what I remember, he’d strike out alone with said burro and wouldn’t tell anyone where his mine was. There were carrots in his garden as a treat for the burro and as a kid you can imagine my delight in pulling a few, washing them off and feeding the burro. He showed me how to pan and picked a nugget out and gave it to me. I wish I still had it. My ancestors were among the first settlers of the Oregon territory, getting there by wagon train. I admire their spirit and dedication to conquer new lands. Visiting where they lived and raised family makes me appreciate all the people who came before me…I only hope that the generations that follow me get the same feeling. You can go home again. It’s not the same, but it touches emotions that are part of your being. If you are living far from your hometown, what is it you miss the most? This entry was posted in Pepper's Posts. Bookmark the permalink. I grew up a few miles from where I live now. But I get nostalgic about my grandmother’s house in Vancouver. When I was a kid, we drove across the country every couple of years to visit her. The house was torn down after she died about 15 years ago. I was very sad to see it go. I still remember every nook and cranny of that house and the woody smell in the cupboards. We moved away from Lubbock, Texas a few days before I turned six. My dad worked on nuclear subs, so for the next four years we moved a lot. Pascagoula, MS; New York City; San Diego, CA; back to NYC. Dad got tired of moving and took at job at Texas Instruments in Richardson, TX when I was ten, and we stayed there until I married and moved to a different Dallas suburb. I remember very little of my early years, though I do remember visits to my grandparents who lived south of Lubbock, playing with my cousins in the windmill house, chasing and catching horned toads, playing in the drainage ditches after a rain, walking the cinderblock border around my grandmother’s rose garden, chasing the train down the tracks, and drinking milk from aluminum cups–milk so cold there were ice crystals in it. My grandmother’s pantry always smelled like Graham Crackers and she never failed to have several boxes of them for the grandkids to dip in the milk. It was my favorite snack until a few years ago when I had to go gluten-free and couldn’t eat them anymore. I miss them. We went to see my grandparents’ place a few years ago and it broke my heart. The house has been turned over to transient cotton pickers and they’ve destroyed it. The cinder blocks are gone, the rose garden is nothing more than dust and trash, the windmill is gone. It’s one time I wish I hadn’t gone back. Oh, that is sad. Like the leaning house above. If it was Aunt Dot’s house, it’s a shame. My aunt doesn’t remember it at all. Going to see my Granny’s house and my grandfather’s house always makes me sad. Other people live in them now, but it’s not the same. The lilac bush by the back door is gone. So is the chicken coop where I tried to gather eggs while the chickens didn’t appreciate my efforts and kept pecking me. The massive tree down the block that I learned how to climb and would perch up there, feeling proud of being able to do it. But it’s like one door closing…your memories are precious and you’ll always have them. Your memories are priceless! Love the 1890’s house. I can imagine so many things that went on in that house. I’d like to have known Walter. What a character he had to have been. Treasures for sure. 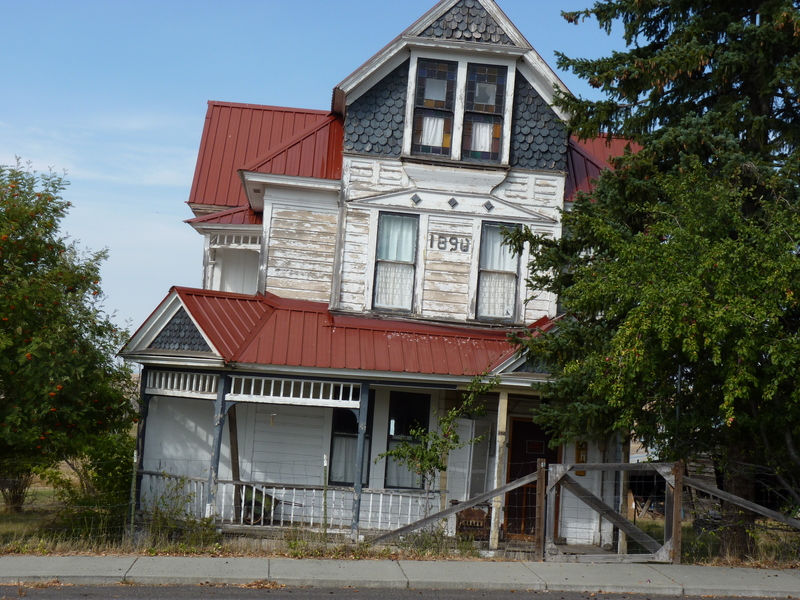 I tend to go visit the old houses where I lived when we visit Idaho. Somehow it centers me. I had a small grocery store that sold penny candy. We got a handful for a nickel. My hometown was Dundalk, Maryland, just outside Baltimore. Now I live in Northern California and I miss the seasons. I miss the piles of leaves in the park in autumn. I miss the first spring flowers popping up from beneath the snow. Crocuses I think. I don’t miss the humidity at all!! I lived in Northeast, MD from the fourth grade to seventh grade. Another small town. The maple leaves in fall were so beautiful and I miss the crocuses as well. Sometimes there would still be snow on the ground and they pushed upward and opened letting you know that spring was coming. That was another nice place to grow up in. What wonderful memories Pepper, thank you for sharing. Glad you got to go back and visit! Pepper, it’s wonderful that you were able to go back and enjoy the place. I terribly missed the place where I grew up, but when I went back after seven years, I was terribly disappointed. The streets, buildings and people haven’t changed, but I changed so much, I felt I didn’t belong anymore. I hated losing my beautiful memories. The cow in the front yard certainly is something. What a great post. No wonder you’re able to capture such rich characters, Pepper! Oregon is like the far side of the moon compared to the Gulf Coast, isn’t it? Loved the pictures and the post. That house actually belonged to my great-great grandparents, The Pattersons. They owned saw mills and later moved to Eagleville, CA. I have a photo of that house cir about 1915.It’s beautiful. Let me know if you would like a copy of it. The Lee House. My great-great-grandfather built that house after coming over the Oregon Trail from Arkansas.